I always associate camelias with the month of February. Camelia bushes are a popular choice for shade gardens here in our microclimate of the San Francisco Bay Area (very Mediterranean). In other milder microclimates of the Bay Area where there is more fog and overcast days camelias grow in full sun. Regardless, in February there is a profusion of wonderful white, pink, and red camelias in many Bay Area gardens. When I was attending Mills College in Oakland to obtain my Bachelor of Arts degree, I was amazed at the giant camelia bushes that grew next to the music building. The bushes were 2 stories tall! And in February they would be just covered with blooms! It was such a wonderful sight that I can't even begin to adequately describe. So you can imagine my delight when we moved to Rosehaven Cottage and found a very mature red camelia bush growing in the narrow 5 foot garden on the north side of the house. Although the bush had been poorly pruned for a number of years, it was not beyond help and it was quite healthy and happy in its location, standing at a height of about 5 1/2 feet. Since that strip down the side of the house was the only location on our property that could serve as a shade garden, I decided then and there that I was going to add more camelias and have them be the star feature in a gorgeous line--one under each window on that wall. I had (and still do have) visions of them being just as tall as the bushes I loved so much at Mills College. Why is it that I am so enamored with camelias? Well, I am really drawn to their thick waxy green foliage. The leaves are such a beautiful shape. And the glossy texture is so wonderful to the touch. Even when the camelia isn't in bloom (which is large part of the year) the foliage is still so attractive to me. I also love the buds. They are such perfect symetrical little orbs looking like eggs ready to hatch. 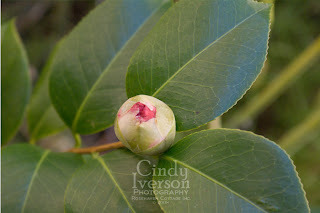 I love to see the the petals of the future blooms peeking out of the top of the bud. It means that February's show is about to begin. The first growing season that we spent here at Rosehaven Cottage was 7 years ago. 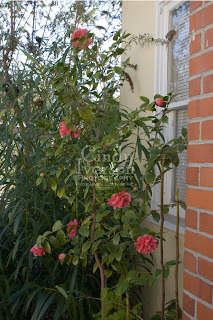 And the camelia bushes for the shade garden were one of the first major acquisitions I made. The camelia at left grows just outside our living room window. I anxiously waited year after year for it to get tall enough so we could see its blooms through the window. Last year we met that major milestone as one bloom peeks its colorful pink head high enough for us to see it. Last summer it experienced a major growth spurt so that now we are able to see most of the blooms from the window. When we had the house repainted in the fall of 2006 I was so worried that the camelias wouldn't like being disturbed by the painters' activities. My worrying was all for naught. The camelia didn't care one bit. And just to prove me wrong, it had that big growth spurt I mentioned above. I love how the deep green foliage looks against the butter yellow of our house now. It looks like that's the way it always was. The one mistake I made when I first started gardening here at Rosehaven Cottage, was to not properly catalogue and journal my plantings. I wish I had. The tags that I left on the camelia bushes are long gone, and now I haven't got a clue what variety each one is, which is really pathetic now that I'm writing a garden-related blog. It's even worse if anyone asks me what variety one is so they can get one just like it. I end up having to fess up and looking rather silly. I just chalk it up to gardening inexperience. Aside from the small patio garden we had at our apartment prior to moving to Rosehaven Cottage, I had never had a garden of my own. Who knew that I should be writing this stuff down? Now, whenever a beginning gardener comes to be for advice and tips, I try to remember to tell them that they should really keep a garden journal of some sort as they plant their gardens. That way they don't end up with unidentified camelias and rosebushes like I've got. Regardless, it looks to be well on its way to being one of those huge tall beauties that I wanted even though most of the others I planted are remaining smallish. At least this one and the original camelia at the opposite end of the house are big and beautiful. They'll be like big camelia bookends someday, I hope. Just wonderful Camelias. I love the way you write your blog entries. It's like reading a nice book. I'm a beginner gardener and have tried to make note of all that I have planted. There are still many times that I blank on the names of something I have. 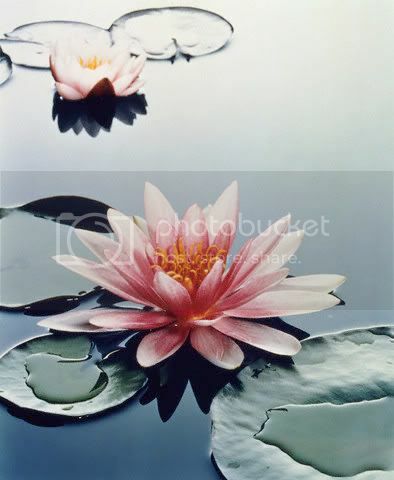 The last camelia you posted is beautiful! The flowers are exquisite. The deep-pink Camellia is one that I'd love to have! 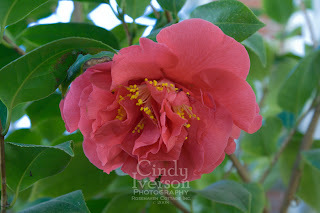 My mom always had that gorgeous red camellia on her porch, remember? I will forever associate camellias with home. And red geraniums because my dad loved them! Beautiful, Cindy! A breath of spring. We are still battling our way through new snows and very cold weather - so I'm glad to visit your virtual garden!! Hi Cindy, what beautiful flowers! I have just seen a message Mum left about treating herself to one...she has already bought a big sackful of daffodil, a load of potatoes to plant, several more fruit bushes and we've nowhere to plant them! Haha:) We are just hoping we can get a house soon so that we can have a garden and make it really nice, instead of what we have now...4 grey walls, an old outhouse and a cement floor. I always feel much happier when I come and visit you at your blog with your sweet animals, fantastic hobbies and beautiful garden. P.S. Lucy and Dexter look so happy together. It's nice to see her looking so well, and Dexter too! The photo reminds me of when we decided to keep Rani. She was that small and Mum's cat Smudge was (and still is) that big. They used to play together all the time and he would pin her down and give her a bath and licking her ears but now she is growing up, she doesn't want to play as often...usually when it is time to go to bed!! They are so pretty. Mine look like peppermint. I have seen pink and red, but not one like this. I will have to try and get a picture. And oh how I wish we could grow them here! I always ooh and ahh over them. I love that red and the deep pink! This is Alabama's state flower. I really miss seeing them. Yours are extraordinary! 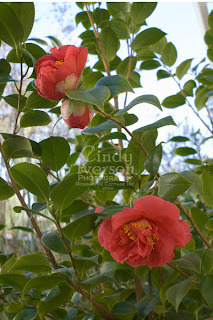 Love your blog entry on camelias. You write so beautifully. Makes me miss the wonderful Bay Area climate... and smells... can you smell that salt air? Beautiful...they're almost otherworldly, aren't they? They don't grow here except as houseplants or in greenhouses--I've never tried one, that's for sure, but I know of a plantsman who has some growing in one of his greenhouses. They're probably getting ready to flower, too! I just LOVE camelias but lost a whole heap of them in my backyard last year due to the drought here in Melbourne, Australia. I managed to keep one which the flowers seem to remind me of a huge rose (white with the tips a lovely pink) I ended up re-planting this one in a nice big pot so fingers crossed it blooms this year after being transplanted. Shhhh...today is the SURPRISE BLOGGY BIRTHDAY PARTY for Kari's 40th birthday...hop on over for a little cake, diet coke, and birthday cheer!!! Thanks for the beauty of camelias~one of my favorites. I have a hedge of camelias (1 is a pale pink and white varigated) which I adore. I'm so happy, my neighbor across the street planted a yard full of camelias. What a beautiful site when I sit on my porch. What wonderful flowers Cindy! I was looking for a picture of a Camelia to show my daughter, and how surprised I was to find this lovely blog from a Mills alum. I too went to Mills (00) and am now living in North Carolina. 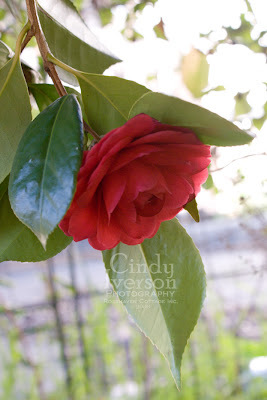 I've planted a row of pink Camelias along my fence, and am waiting for them to bloom (they are only 2 feet high so far). The red clay soil here doesn't look too fertile to me, so I am crossing my fingers..